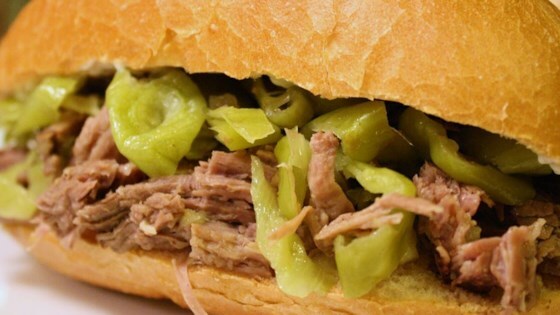 "Roast beef cooked in a slow cooker with garlic and pepperoncini makes a delicious and simple filling for gyro sandwiches. Serve on hoagie rolls with provolone or mozzarella cheese, and your choice of condiments." Make small cuts in roast, and insert garlic slices in cuts. Place roast in the slow cooker, and pour the entire contents of the jar of pepperoncini, including liquid, over meat. When making the sandwiches, place meat in rolls, top with cheese, and zap in a microwave for a few seconds. Don't forget to use the pepperoncini in the sandwiches! Slow-cooked spicy & garlicky roast beef.